Garth Brooks, born Troyal Garth Brooks, has had a successful musical career as a singer and songwriter since his start in 1984. Brooks has had a noteworthy impact on the country music scene, taking the genre into a new era as he combined honky tonk, folk, and rock to create music that he would like to hear. Brooks has stated that he believes he is an average man and that he can appeal to the everyday person by creating music that he would like to hear. Brook’s popularity is irrefutable, as he is one of the world’s best-selling artists of all time. He’s managed to change the country music scene, ushering in a new era and paving the way for the current stars of country. Brook’s has won two Grammy’s for Best Country Collaboration with Vocals and Best Male Country Vocal Performance, while being nominated for numerous others. Brooks also won a Grammy on the Hill Award for Solo Artist of the Century in 2010, as well as winning seventeen Billboard Music Awards out of his 23 nominations. Brooks “retired” from touring in 2000 as a result of personal issues, but has since returned to the scene. In 20014 he embarked on his first worldwide tour in 13 years with wife, Trisha Yearwood. The Garth Brooks World Tour with Trisha Yearwood is currently on its seventh leg and is expected to continue through 2017, with tour dates being added as a result of high demand to see him live after his retirement kept him away from the stage for so long. 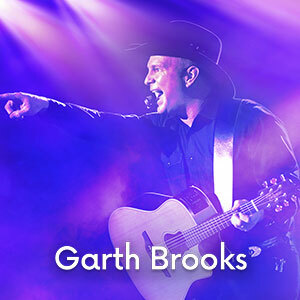 Tickets for The Garth Brooks World Tour are on sale now!